Posted by robert jarvis in .. 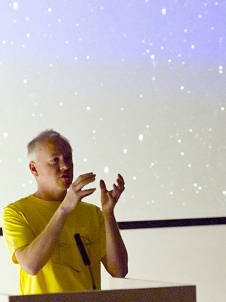 Connected with the aroundNorth event for Deal Festival were a number of workshops for both primary and secondary school students that looked at some of the underlying elements that inform the astronomical work. This video is of a music workshop with music students from Canterbury’s Dane Court Grammar School who came to Pines Calyx to visit the installation and work in situ. 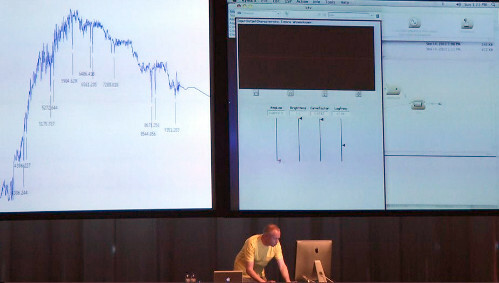 In this practical music making session, the students explored ways of using astronomical data to inspire contemporary music composition and performance. The video was created by Bradley Lloyd-Prest on behalf of the host organisation (BayTrust) and the live recording was mixed by ‘Hand On Heart Arts’. aroundNorth will be providing the focus for an immersive evening of art and music as part of this year’s Deal Festival, in Kent, on Tuesday 4th July. The installation will play in the grounds of Pines Calyx from between 7pm and 10pm, and also within the garden on that evening will be a number of musical and artistic interventions with performances by musicians Stina Wilson (flute) and Andrey Debedev (guitar), as well as local artists creating live responses to the event and its concept. 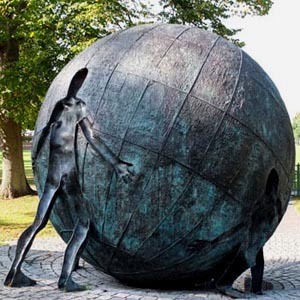 The evening will also give the audience the opportunity to explore KRONOS – a newly designed path around the grounds which demonstrates the passing of time, from the ‘Big-Bang’ until the present day. Booking for this event is directly through the festival. Here is the eighth shorth film in our series of short film documenting aroundNorth. 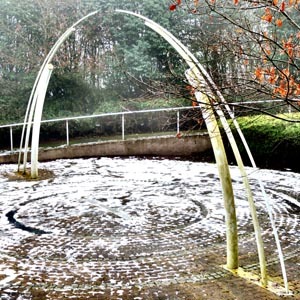 This one focuses on the return of the installation to the Beaghmore Stone Circles complex, near Cookstown, in Northern Ireland. A big thank you to all those who helped with this event, especially those brave enough to be interviewed for their thoughts of their experience. Another great night, this time in the inspiring setting of the Beaghmore Stones complex. For most of the evening we had clear skies, as well as a full moon rising in the east sky as the sun set in the west. We had an audience of at least 150, enjoying the stones, the sound installation, the hot soup, and the telescope viewing. A great night yesterday evening at Antrim Castle Gardens. 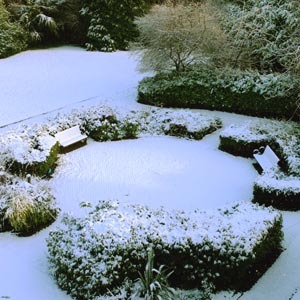 We set up in the Large Parterre Garden, which with its large circular centre, compass point pathways and lack of light pollution, was a brilliant location for the installation. As usual, I prepared a guided listening chart showing the exact times that the more well-known stars will be sounding, and from which loudspeaker, and here I am in the above picture with Deputy Mayor Noreen McClelland & Councillor Jim Montgomery connecting the sounds heard with the stars overhead. aroundNorth will be featured at two special evening events this October. The first will be at Antrim Castle Gardens on the evening of Thursday 13th, and the second will be a return visit to the Beaghmore Stone Circles complex on the evening of Saturday 15th. To mark the occasion of St Patrick’s Day this year (tomorrow), Armagh Observatory will be offering a guided listening session of ‘aroundNorth’ conducted by Professor Mark Bailey. This event will be free to visitors and will also include a free public tour of the observatory buildings, astropark and human orrery. Proceedings will begin at 4.30pm and last up to two hours. For the whole of October, aroundNorth will be exhibited at Ards Arts Centre, in Newtownards. 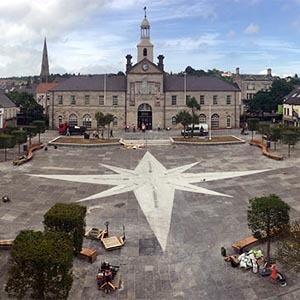 Since my initial visit last March, the town has completely regenerated Conway Square immediately in front of the arts centre and town hall building, and it now boasts its own star design. I am sure it wasn’t done just for the installation, but anyway, for those arriving at Thursday evening’s Exhibition Launch by helicopter, the location should be easy enough to spot. More information on opening times and the Private View at: http://ardsarts.com/blog/aroundnorth. As part of Sligo’s ‘Culture Night‘ celebrations my aroundNorth installation will be featured at The Model Arts Centre on Friday 18th September. As a prelude to the installation itself (running between 8pm – 11pm) there will be a workshop for musicians interested in exploring the feasibility of using musical skills to interpret star catalogue data. 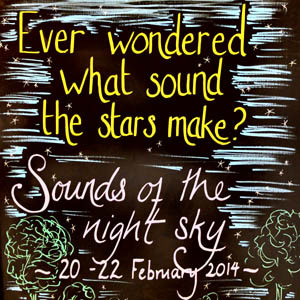 The workshop is open to all musicians who would like to bring their instruments and explore this link between science, astronomy and art. 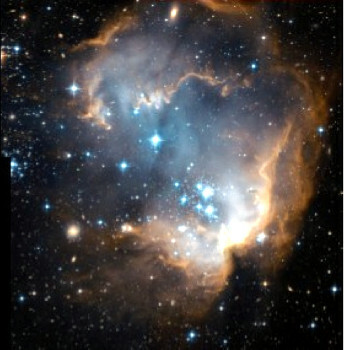 Be prepared to experience the stars as you have never heard them before! Here is a short movie documenting the recent tour of aroundNorth around Northern Ireland. It shows the preparation leading up to the evening performances at the various locations, and hopefully a flavour of the installation event itself. Many thanks to Julie McGowan for her camera work and editing facilities, as well as to Armagh Observatory who commissioned the piece. With the tour of aroundNorth around Northern Ireland complete, and the installation now running daily at Armagh Observatory (Monday to Friday: 9am – 5pm; and other times on request) I now have the time to upload a couple more short aroundNorth movies. 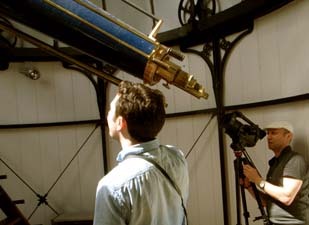 The above linked film documents the physical installation at the Observatory at the beginning of the year. Today is the official launch of the permanent version of my installation at Armagh. Five and a half years after my initial visit to the observatory in September 2009, the installation has been finally realised in its permanent form, and yet the journey is not over…. I’m glad to say that the piece has been well received by all who have attended the various events. Those with little astronomical knowledge have found the experience fascinating whilst those more learned in astronomy have expressed excitement about the work’s potential. More importantly perhaps, comments about the piece’s musicality have also been positive, referring to the work as “reflective”, “grounding”, and even “healing”. 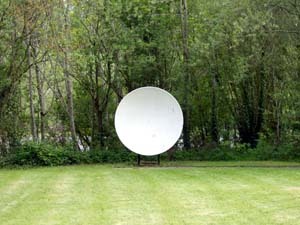 The physical component of the aroundNorth installation for Armagh Observatory is now complete. We just finished connecting everything and digging in the speakers when the snow began again, and after one more day of finishing off the inside work (in the warm) the Human Sundial area was completely covered. We now wait for Spring and our official launch at the Observatory on the 19th March. With all the cables laid: trenches dug and refilled, the task for this week will be to connect everything together and get the installation sounding as good as possible. The snow has now all melted away although there is still a layer of ice on everything in the mornings, but as the hard-graft is now mostly complete, the weather is not so important. A few dry days would be good though as I will need to set up a mini-studio in situ in order to re-EQ the audio to best suit the loudspeakers and the actual installation environment. As well as this, I intend to visit some potential sites around Northern Ireland in preparation for a planned mini tour of the work to coincde with the observatory launch in March. More later…. Over the next couple of weeks I will be based at the Armagh Observatory in order to physically install what will become the permanent version of the aroundNorth installation. This entails digging in the weatherproof speakers, burying the audio cable, some retarmacing and some knocking holes into walls. So quite a lot to be getting on with, especially as the area for the installation is already densely planted with shrubbery. Weather-wise it is looking to be a cold week with snow, ice and later rain, and so that will be another challenge. 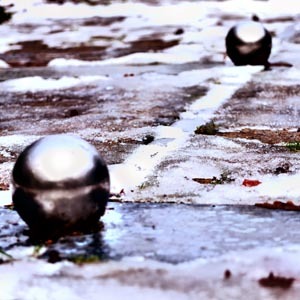 Still, as long as the ground isn’t frozen, then good progress should be able to be made. Artist Julie McGowan will be documenting the install onto film, so expect another short movie before too long! Thanks to the artist Van Gogh who went to the bother of painting his “Starry Night” picture back in 1889, aroundNorth is featured tonight as part of the Van Gogh Huis ‘Starry Night Event’ in Zundert, Netherlands. The venue will be a huge field with minimal light pollution and with very good views to the horizon all round, and the event will begin one hour after sundown. The weather forecast is predicting clear skies to begin with and then high cloud blowing over later on in the evening – so a moody setting: probably just about right for a van gogh event. About 120 people are expected over the evening, divided into four groups and entering the installation space every half-an-hour before moving onto one of the evening’s other features. From today aroundNorth will be at The Beaney House of Art & Knowledge, in Canterbury, Kent. The Beaney is a key partner for aroundNorth, having supported the project from its very beginning, and so it is fitting that the installation should have its first gallery appearance here. aroundNorth will be at The Beaney until the end of August and is accompanied by two other exhibitions inspired by the work and its subject material. This installation is also significant as for the first time the sounds are being triggered from the newly created aroundNorth audio player. 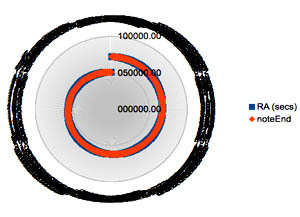 Created in collaboration with programmer David Moss, the audio player references the installation’s longitude, the date and current time and then plays the composition in synchronisation with the rotation of planet Earth from the correct part of the aroundNorth score so that what is heard is exactly what is happening overhead. Up to now, the performances have been programmed onto SD cards and played back using QTX technology, and so this is quite a step forward. This installation is therefore also a good rehearsal for when the installation is permanently installed at Armagh Observatory next year, when the audio player will trigger the sounds there. A third film of the recent aroundNorth performances at Stowe and at Armagh has been posted on the internet. The film has been made by Alistair Will, of Outdoor Culture, who also produced the Stowe event and has played an important role in helping to secure the PRSF Beyond Borders funding in order to make the installation a reality. I think this short movie is the best one yet, and complements the other two brilliantly. As the aroundNorth installation just happened to be scheduled during Northern Ireland’s ‘Creativity Month’, we benefited from a visit from Creativity NI who came complete with movie camera. As a result we have a new aroundNorth short movie, which can be seen by clicking on the image above. Yesterday we had the aroundNorth launch at Armagh Observatory. In contrast to last month’s performances at Stowe, where the installation was scheduled for night time and in full view of the stars, the Armagh presentation was scheduled for during the day. What was interesting was that this difference in timing didn’t seem to effect the success of the piece. Sure, in darkness and under a clear starry sky there was almost a magical connection between what was seen and what was heard; however, the installation seemed to be just as engaging in broad daylight as it connected with people’s imaginations and memories of star-filled skies. (Maybe similar to the difference between a radio play and the television adaption – better pictures on the radio…). I began the morning with an Radio Interview with BBC Radio Foyle, and then headed for the Observatory to set up for the day’s events. We had four sessions during the day, each one beginning with an introduction to the work from both the Observatory’s perspective and my own, and then it was time to experience the installation (with optional guided listenings) as well as a chance explore the Observatory grounds. A full and good day in all. Again, everyone was very positive about the work, with lots of comments on how it made people think differently about their relationship to the heavens above them. 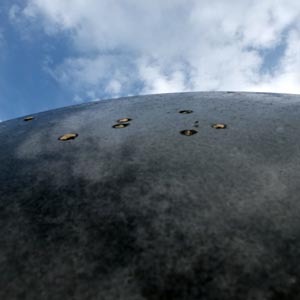 On 22 March aroundNorth will visit Armagh Observatory (just for one day): to introduce people to the work in preparation of its planned permanent installation next year in the grounds of the Observatory’s Astropark. 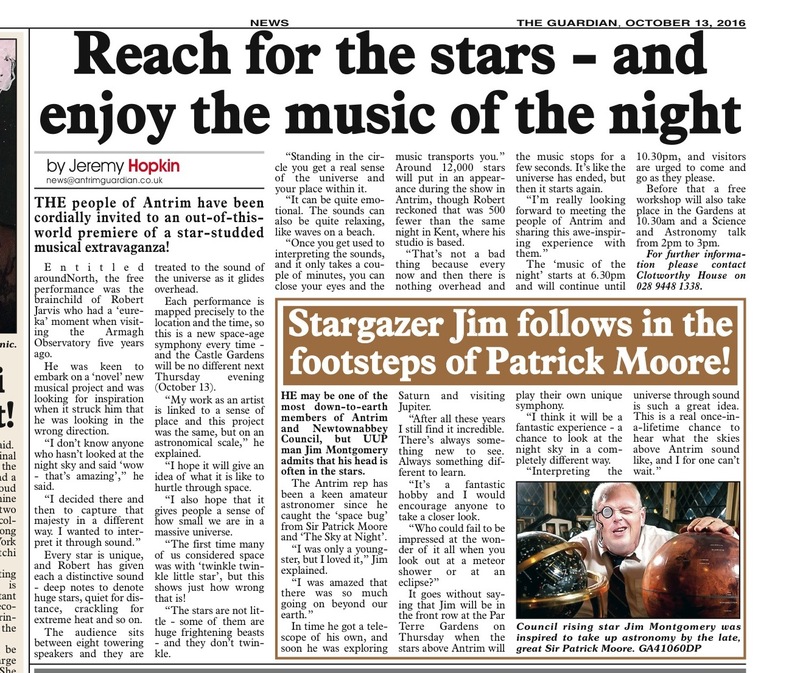 It was as a result of a visit to this observatory back in September 2009 when I met astrononer Simon Jeffery. He shared some of his research with me from monitoring variable stars around Celestial North Pole. Using the polar bear telescope on top of the observatory he had been taking photographs of the area around Polaris at midnight every night. 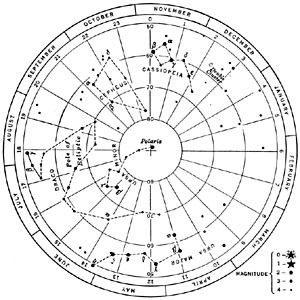 As it takes a few minutes less than one day for the stars to complete one full revolution, in each photograph the stars had moved round about one degree. 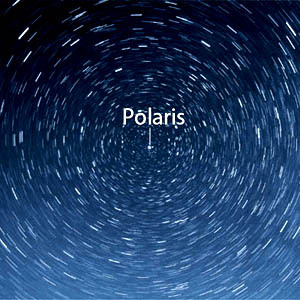 When I was shown sped up footage of one photograph after another, it appeared that the stars were moving around Polaris – a bit like the insides of a music box, or a carillon. 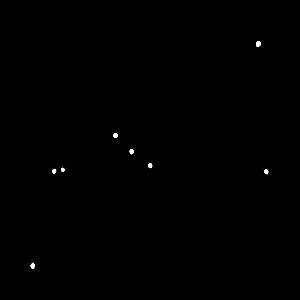 I commented that if there were sensory lines coming out from the centre, then every time a star crossed a line, it could perhaps make a sound depending on its size, brightness, and distance from Earth, and the idea for aroundNorth was born! 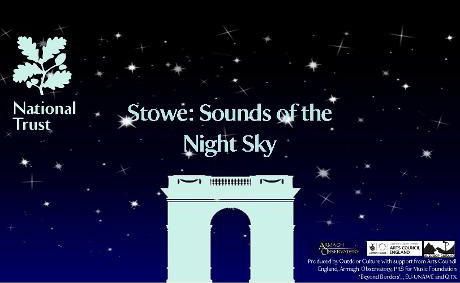 Unbelievably, we have had three nights of no rain and mostly clear skies for our performances in Stowe, which is impressive in its own right. 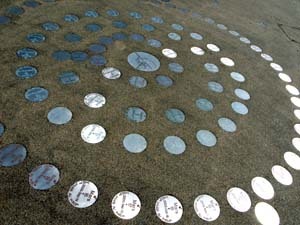 The installation stretched about 20 square metres with a circle of eight speakers and was placed on a gentle south-facing slope towards the constellation of Orion. People came from far afield (Vienna and Ireland) and I am pleased to say that the piece seems to have been very well received, with, I think, everyone without exception being very positive about their experience and how the installation has made them think differently about the stars and our relationship to them. Pole Star to a specific place open to the skies and listen to the movement of the stars across that line in time with the earth’s rotation. 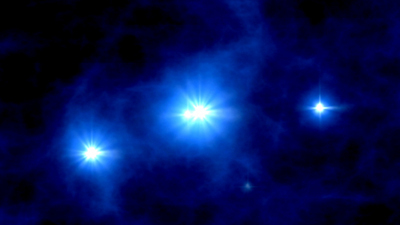 Each star has been given its own note, harmonics and volume, reflecting the distinctive spectrum, size and brightness of each star and its distance from Earth. 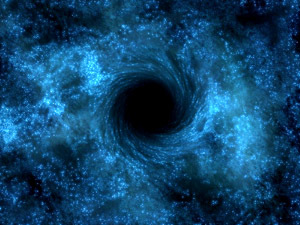 The effect is to make three-dimensional and visceral a relationship with the stars which is usually the two-dimensional one of gazing at the apparently unchanging canvas of scattered twinkling points of light round “that inverted Bowl we call The Sky”. The programme notes for aroundNorth are a stellar playlist. As each crosses the invisible line to Polaris – at a precise time that is different for each of the three evenings of this installation – it is named, with some characteristics noted and the length (usually between thirty seconds and just over a minute and a half ) of its sound. This makes for an entirely novel sensory and emotional engagement with objects – or can we call them beings? – that are, on the normal human scale, unimaginably huge and remote. Listening to their sounds is a relationship that is both intimate – like the groans of a calving glacier or the call across the ocean of a humpbacked whale – and fleeting. 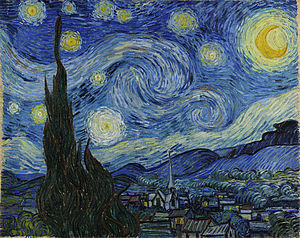 One can imagine that after listening long enough to the stars from roughly the same latitude one could start to recognize them and even be able to place them in relation to each other, like the instruments in an orchestra or a magnificent multi-choral composition with separate choirs scattered around a huge cathedral. Alistair and I visited Stowe Landscape Gardens today to check everything is in place for next week’s performance. Thankfully, it does look like the weather is turning a corner, and we might just have some good weather; nevertheless we worked out a comfortable Plan B in case of inclement weather. Due to all the recent rain we decided to change from our initial location of the property’s ‘Lamport Garden’ to a an open south-facing field with 360 degrees of horizon view. In the right conditions this should provide a stunning location from which to experience the installation. 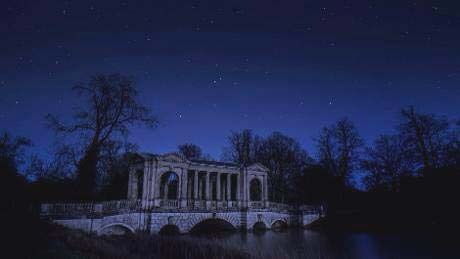 In collaboration with the National Trust, the premier of aroundNorth will be showcased in the beautiful Stowe Landscape gardens, in Buckinhamshire, for three consecutive nights on the 20-22 February. 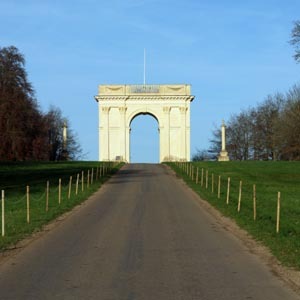 Last we week we heard that our Arts Council bid for an aroundNorth event at the Stowe Landscape Gardens National Trust property, in Buckinghamshire, has been successful. So, today we visited Stowe Landscape Gardens to see what specific locations within the site might be possible, as well as plan out exactly what might happen. 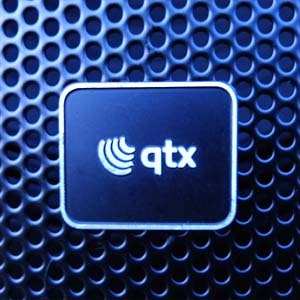 This was also a good opportunity to bring up a couple of the QTX speakers and test them in location. Our plan is to stage three aroundNorth performances at the end of February next year. Following on my meeting with David last week, over the weekend Alistair and I made a quick visit to Armagh Observatory to thoroughly plan aroundNorth‘s delivery. Currently, as we have just about enough funds to make aroundNorth happen, we have to be very exact about how the project will be realised – as if the project wasn’t challenging enough…. So, in order to further boost funds, we are also considering an application to the Arts Council for a performance at a National Trust property in Buckinghamshire. The idea is that the composition will run outside over a few nights so that it is possible to look up at the stars at the same time as experiencing the work (weather permitting of course). Thankfully, the execution of such a proposal has been made a lot easier due to recent additional support from QTX who have expressed an interest in helping out and providing us with a supply of their rather excellent battery powered speakers. These will give us the flexibility to be able to stage the work more-or-less anywhere, and so opens up a whole range of possibilities…. When aroundNorth is finally complete it will have to be played on a specially designed audioPlayer. This is for a number of reasons. First, the installation will be multi-channel (I am not sure how many channels at the moment – just that I want the experience to be immersive). The second challenge is the length of the composition: I need a player that can cope with a multichannel audio loop of 23 hours 56 minutes and 4.01 seconds! Finally, to make life easy for touring the work, I would like my player to know where it is on Earth and also what time it is, so that it is able to deduce the local sidereal time, and therefore know from which point in the composition to begin playing. To this end, I have commissioned David Moss to build such a player for me – he is flying over from Prague next week to learn a bit more about the project and see what exactly is required. We have been successful in our funding bid to the PRSF’s Beyond Borders scheme. This means that with the EU-AWE funding already in place aroundNorth is definitely happening! The work will premiere in 2014 (exact details still to be decided, but safe to say: a lot of work to be done between now and then. To begin this process, I look forward to calling in on the Observatory next week to chat through logistics. Over the summer we have been looking at some other possible locations that could host aroundNorth in order to strengthen our Beyond Borders bid. We are keen to take the work to both gallery and remote outside locations (although the latter has some obvious challenges attached). An interesting development is a recent collaboration between the Arts Council and the National Trust and so that might be an area to explore…. Good news. 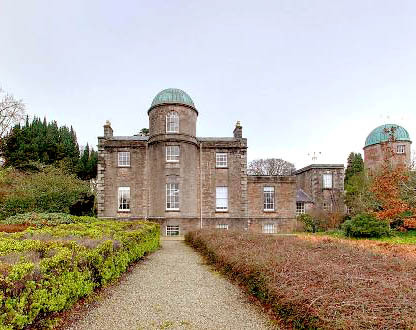 Armagh Observatory has been in contact today to say that they have found some EU-UNAWE (Universe Awareness) funding in order to help kick-start our project. In fact this offer of funding is very timely as we are now looking at applying for the PRS For Music Foundation’s newly opened ‘Beyond Borders’ scheme. As aroundNorth was runner-up in their New Music Award (can you believe in 2010?) I would be hopeful of a positive decision, but you never know…. (The outcome should be known by mid-August). After what has been a fairly quiet six months with various unsuccessful funding bids, Alistair (Outdoor Culture) and I are pursuing with a number of new opportunities. We still have strong support from the Observatory as well as from a range of other people and so we are encouraged to continue. In the meantime I am continuing to work on the technical aspects of the project (which are huge, but progress is being made…). Had a good meeting today with Charlotte and Alistair (the producers for aroundNorth) to discuss new developments, and to make plans. This was followed by conversations with potential app manufacturers with an aim of understanding how aroundNorth could be transferred to mobile devices…. We now have a number of different funding strategies that we hope will combine to allow us to fully realise this project. Plus, we also have a potential première of the work in August. So, a lot of hard work over the next eight months to bring everything together and make aroundNorth a success! In order to capitalise on the opportunities available to promote aroundNorth, I am now considering three potential versions of the piece. 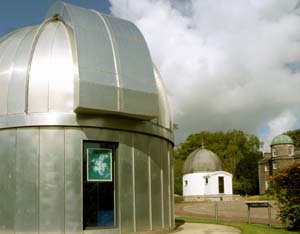 The first, of course, is the original concept of the permanent installation for Armagh Observatory (see below). Another possibility is a performance version capable of touring, not just to galleries, but also to dark outside places where an audience would be able to hear my composition whilst looking up at the stars. Finally, there is the possibility of an app being developed, so that people can have access to the piece wherever they are. Each version will have to be different in order to effectively communicate to its specific audience; however, I’m sure that the original ‘music box’ concept will have a fundamental role in all versions. Today I met with not one, but two (!) people who have expressed an interest in helping to produce the aroundNorth project. They are Charlotte Burke and Alistair Will. For the past six years Charlotte has been working with the PRSF and so she is excellently placed to help with funding applications; and Alistair runs the Outdoor Culture company which specialises in the production of events that connect people with their natural environmental heritage. So, a good combination, I think. Over the next few months we will begin to plan how we might work with the aroundNorth concept to produce not only the originally proposed idea of a permanent installation in Armagh, but also a series of happenings and different locations across the UK. This week I have been in Armagh to re-visit the Observatory and to talk with Professor Mark Bailey, the director, in order to discuss how the plans for aroundNorth are developing. We are both still keen for the project to go ahead, and now feel that it would be useful to have the help of an independent producer to assist with securing the necessary funding to make the project happen. So, that will be my next task: to find one. Whilst at the observatory I was also able to talk through aspects of my proposed sonification process with some of the resident astronomers to check that I am on the right track in my attempts to interpret the different forms of data available to me for the eventual realisation of the astronomic composition. My most recent presentation for my aroundNorth project was at last weekend’s Kyma International Sound Symposium, which this year was held at La Casa da Música, in Porto, Portugal. Kyma is the sound design language that I am using to create the installation, and this year the conference theme was Exploring Sound Space, and so it seemed like an opportunity to good to miss! An online movie of the presentation can be viewed here. Although it has been almost a year since my last post, work behind the scenes for aroundNorth has been continuing – looking for possible avenues of funding in collaboration with the Observatory in Armagh. Of course, at this time in the UK (and beyond) it is a time of financial uncertainty with many art initiatives receiving cuts in funding and so, in order to help raise the project’s profile, I have been trying to spread the word about my proposed project. Last night, for example, I presented the ideas behind aroundNorth at the new Turner Contemporary Gallery, in Margate, Kent as part of the gallery’s Late Night Live events programme. 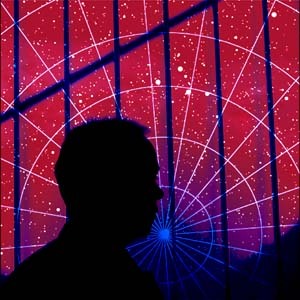 I was joined by astronomer Brendan Owens (currently based at The Royal Observatory in Greenwich) who contextualised my work from a more conventional astronomic viewpoint. The evening was well received, and it was great to come across so much enthusiasm for the project and what I want to achieve through its creation. With Liminal winning the 2010 New Music Award (congratulations to them!) I now have to rethink how aroundNorth may be realised. Everyone I spoke to at last night’s award ceremony remained enthusiastic about aroundNorth‘s potential, and certainly Armagh Observatory is still dedicated to the project. So, it’s back to the drawing board for the moment to consider the most appropriate course of action. A short film promoting aroundNorth and the ideas behind it is now online and available for viewing on the PRSF movie channel. Created over the last couple of months in collaboration with the media company Kin Design the film will also be shown across the UK at the following ten venues: Belfast Blackbox, Bristol Watershed, Cardiff Chapter Arts Centre, Dartington Hall, Glasgow Centre for Contemporary Arts, Liverpool Bluecoat Arts Centre, London ICA, Manchester Cornerhouse, Nottingham Broadway Media Centre, and The Sage Gateshead. As part of the New Music Award shortlisting I am now in conversation with production company Kin-Design in order to help promote my proposed aroundNorth project. We spent today filming in the grounds of Armagh Observatory, and over the next few weeks will prepare the movie for public view. 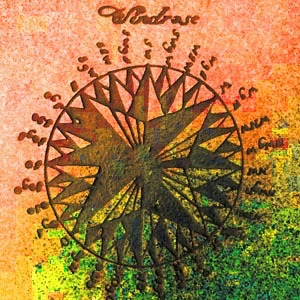 aroundNorth has been shortlisted for the PRS for Music’s 2010 New Music Award. Created to recognise and celebrate leading innovators in the UK and provide investment, support and profile for exceptional and pioneering music creators, the award encourages creators to push the boundaries of their artistic practice, extending the possibilities of music regardless of which genre they work in. It also seeks to raise awareness of the UK’s most innovative music creators in the media and to help them secure the public profile they deserve alongside the UK’s better known creators working in visual arts and media. aroundNorth is one of the five shortlisted possible winners of the £50 000 award, the outcome of which will be announced in September 2010.
aroundNorth is a proposed new musical composition inspired by the movement of the stars around the Celestial North Pole for the Armagh Observatory, in Northern Ireland. Taking the form of a permanent sound installation, the composition will make use of astronomical parameters, such as star size, brightness and distance from Earth, giving voice to the stars and our changing perspective of them as the Earth revolves on its axis. The composition will introduce its listeners to an orchestra of new and mysterious sounds, as the different stars are given their own voice as musical instruments in their own right. By translating their spectra into their instrumental equivalents, aroundNorth will be able to call upon a number of new sounding instruments and offer its audience a so far unheard of stellar orchestra. More than just another new musical composition, aroundNorth will not only be inspired by its subject matter, but will also play in synchronisation with the rotation of the earth and the apparent movement of the stars, thus making a very real connection between its listeners and the wider universe. As it plays, the work will also provide a first-time experience for many blind and partially sighted people to encounter the beauty and wonder inherent in the stars and their celestial patterns.